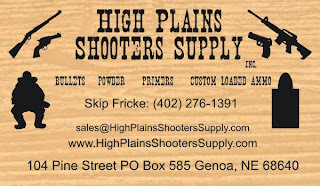 Reloading bullets, Nebraska gun show registration, and cowboy shooting information. Special sales on Cast bullets. 40% off select cast and lubed bullets. .358, 9mm, .44, .45 and more. Call Skip for prices and availability. Call 402 276 1391. We use "High Tech" powder coating on our cast bullets. We have Hornady rejects available. We organize and promote Gun Shows. We vend at many Gun Shows throughout Nebraska. We are always on the look out for materials. We pay scrap price for scrap lead. We pay scrap or market price for brass. You can trade lead or brass for bullets. Sometimes we have primers and powder, please ask. Also check our facebook page for updates. We are opening a physical store at 524 Willard Avenue,in Genoa Nebraska. Hours will be limited to start, but appointments are encouraged. Just call if your coming through and someone can be here. We will have a wide assortment of bullets for sale. 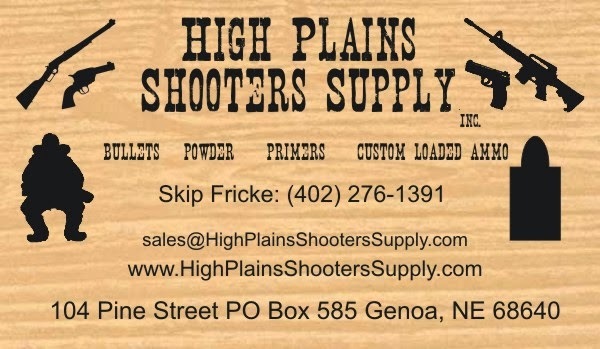 Also we will be able to provide brass, powder, primers and tools for all your reloading needs. We will carry various supplies that shooters can use. Soon we will be introducing our own line of ammunition. Eventually we may carry a limited selection of guns and parts. We are looking forward to this exciting move.